The showbiz legend had the sort of career story worth making a movie for. Kuya Germs is a beloved figure in Philippine showbiz, having raised the careers of many a great entertainer. The comedian-host passed away earlier today, succumbing to cardiac arrest. 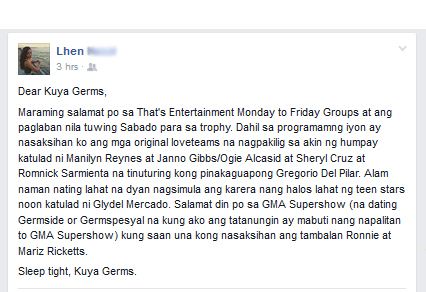 But what else do we know about Kuya Germs? Aside from his lively demeanor that extended past midnight, you probably already know that he's the host of the seminal variety show That's Entertainment, whose Monday, Tuesday, Wednesday, Thursday and Friday groups produced a long, long line of celebrities. We've compiled some more Kuya Germs facts below! 1) Kuya Germs lost his father at an early age. His father, Jose Moreno, died when he was still young. In the GMA-published Kuya Germs coffee table book released in 2013, he recalls the sad episode: "For nine days, hinahanap namin siya. Finally, may nakapagsabi sa amin na nasa American hospital siya kasi nga nabundol siya ng isang American soldier. Para bang hinintay lang niya ang Mama ko dahil as soon as makita namin siya, namatay na rin siya." 2) Kuya Germs took on several odd jobs when he was younger. Kuya Germs worked at her aunt's taxi company, and then sold bibingka, peanuts, and cigarettes. He was also a jeepney barker. 3) Another odd job led to his entry in the showbiz industry. There are two easy ways to get into showbiz: have incredible acting skills or have a face that could launch a thousand ships. Kuya Germs had none of those at the time. Instead, he applied for a janitorial job at the Clover Theater in Recto in the '50s. Then he became the theater's curtain-raiser, before eventually landing bigger jobs in the entertainment industry. In an article on GMANetwork.com, Kuya Germs recalls how he got the part: "Ang dami ko nang trabaho talaga. One time, yung director ng live show, nangailangan ng propsman na magro-roll ng telon. Naispatan ako—pinaghubad ako ng polo. Nung makita ang katawan ko na buto't balat, sinabihan ako ng 'Perfect! Ikaw ang gagawin naming Jesus Christ.'" The role led to several more bit parts in live theater shows. It's ok to sleep Kuya Germs. We all will someday. 5) The breaks just kept coming, and soon Kuya Germs found himself in one of the biggest studios back in the day. In 1963, Kuya Germs, after being honed in the theater, finally got enough cred to get into Sampaguita Pictures. It was here where he met the likes of Dolphy, Panchito, and Gloria Romero. His time in the studio eventually led to his comedic tandem with Boy Alano, whom he starred with in Mga Batang Iskwater, Class Reunion, at Mga Batang Bakasyunista. Susan and German Moreno doing a dance medley in "DANCE-O-RAMA" (1963). 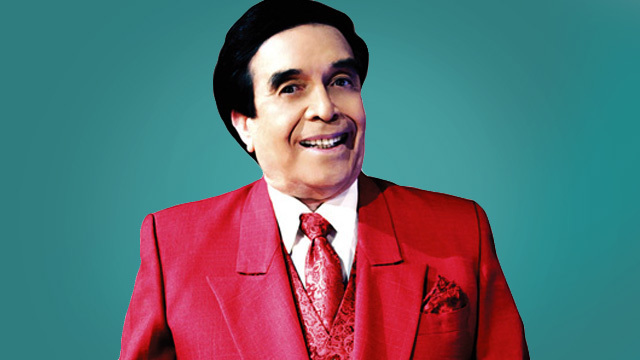 6) Kuya Germs is one of the most enduring hosts in Philippine TV history. Kuya Germs isn't just a star-maker, he was also, in his own right, a TV star. His resume speaks for itself. He first hosted a show in 1978 called Germside. From then on, the hosting stints never stopped. From 1979 to 1984, he hosted Germspesyal; Super in GMA in 1984 as well; GMA Entertainment, 1984 to 1996; That's Entertainment, 1986 to 1996; and then Walang Tulugan which started back in 1997, and is still running now. 7) Kuya Germs wasn't just a host. He was also a producer. The Master Showman was also a Master Producer producing his own shows and several TV movies (such as Kung Mayroon Mang Pangarap, Ganti, Sa Paglinaw Ng Tubig, Ikaw, Ako at Ang Awit, Dalawang Ina, Dalawang Pag-ibig, Larawan ng Isang Ina, and Ina). 8) The multi-talented entertainer also won acting awards. Kuya Germs not only honed the many talents of his actors and actresses; he also won a number of acting awards. He was the Best Supporting Actor for "Paupahan" in the 2009 FAMAS Awards; won a Special Citation Award in the PMPC Star Awards for TV in 2013; and Best Supporting Actor in the PMPC Star Awards for Movies in 2009. He also has multiple Best Variety Show Host trophies from the PMPC Star Awards for TV (1988, 1991, 1993 & 1994). 9) He's the guy behind the Eastwood City Walk of Fame in Quezon City. Asian Journal USA has this quote from Kuya Germs: "When I was living in Los Angeles, California, I would always show to my Filipino guests the Hollywood’s Walk of Fame." Kuya Germs liked the iconic location so much that he brought it home here and spent his own money to build the Eastwood City Walk of Fame in 2006. 10) Kuya Germs' grandson is a Youth Olympic gold medalist. Kuya Germs has an adopted son named Federico Moreno. Federico's son, Luis "Gab" Moreno, won an Olympic gold medal back in the 2014 Youth Olympic Games in Nanjing, China in the field of archery. Grateful for being a part of the recently unveiled Walk of Fame stars at Eastwood. Kuya Germs said to me: Ayan, may star ka na. Puntahan mo. Woke up to a very sad news. Kuya Germs, we know you'll take care of our paths here on earth. Farewell, we hope your soul rests with God. You will always be in our hearts. You and everything you did will never be forgotten. You are a legacy. May you rest in peace, Kuya Germs. Got more #KuyaGerms trivia? Share them with us on our Facebook page!